This is a colour key/concept rendering for a character in the short film. This started as a 3D model (which I did not do). I did a quick lighting pass in Maya, and then painted right over top of it in Photoshop. 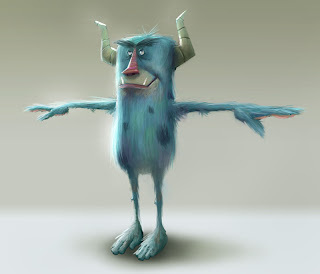 And yes, I am aware that Pixar did a monster with blue fur as well. The similarity ends there, I assure you. Click HERE to see the Quicktime. Threw a quick test together on the weekend to see how the hand-painted environments might look with the 3D treatment. 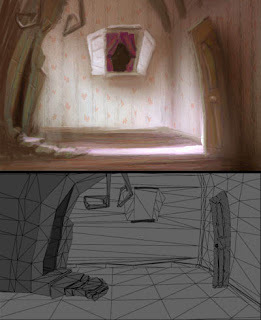 The top image is the original colour key, and below it is the 3D set. The painting gets 'projected' right into the 3D scene, and the result is the ability to move the camera around the painting in actual 3D space. The quicktime video is just a simple camera move to demonstrate the effect. 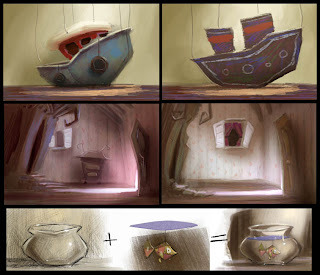 A few more colour keys from the project. 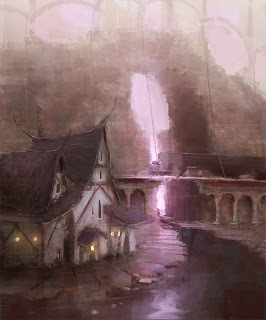 These sets will be built in 3D, then fully painted in 2D and mapped with a common camera projection technique. My goal is to make the finished set have the charm of a small thumbnail. So let's see how badly I can fail at that. A couple work friends and I got together and decided to start a small side project! We're currently in the exciting early stages. The cool thing is that each person is a one-man department. I am the color/background department. Here's some keys that I've done, exploring various lighting and color design. 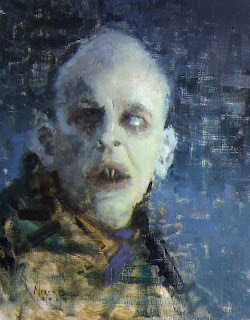 A quick oil sketch of Nosferatu. This is the Klaus Kinksi character from the 1979 version, directed by Werner Herzog. Hard not to be inspired to paint when you watch that film. Next post I'll get back to the illustration stuff, I promise. 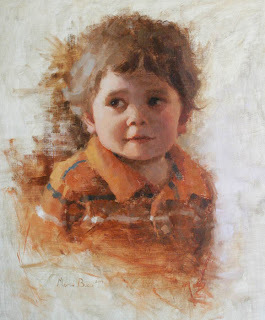 This is the 2-year-old son of my friend and former co-worker, Colin Jack. In fact, some of you may know him from his awesome blog. Easily one of the coolest and best guys I've worked with. I have about 30 of his post-it note drawings of Batman in rehab cluttering up my desk at work.